I hate Google+. Can’t stand it. It is agonizing to use. The stream is so ugly, it won’t even bother me when the inevitable Google ads arrive. Culturally, it feels like walking into a religious school. It swarms with disciples of the + waiting for the messianic downfall of the Evil Internet, so that the One True Google+ is all that’s left. But I’ve been polite. It’s my beat, so I’ve covered it fairly. When it gets a feature I love, I say so. When it does something obscenely bad, I give its creators a fair chance to respond. But it’s getting harder to grin and bear it. I’ve been a happy Google customer product for a long time, because Google tools used to enhance the Internet. But as Google ships “the Google part” of its new Google+ identity, it’s breaking the Web it once helped build. I can’t take it anymore. It all crystallized for me this morning when two Google+ transgressions presented themselves at once. Mike Elgan, “The world’s only lovable technology columnist,” re-shared a post by Rohit Shrivastava, a manager at IBM. Elgan’s post bore an awfully familiar headline, although the punctuation and capitalization had been maimed. It was familiar because I had written it. I didn’t see any attribution, though, let alone a link to the story. Then I remembered that public G+ posts count as websites now, as far as Google search is concerned. Furthermore, Google search now obscures natural Web results whenever possible, giving Google+ results from users’ networks instead. And it hit me: True Believers of the Holy + might see this re-shared Google+ post of an almost-unattributed rip of my story instead of the original. Google+ hates the Internet! That brought me back to an incident on December 24. I was on the iPad, not on my main machine, and I was logged in to my RWW Google Apps account, not my personal account. I don’t use this account. It has no one in its circles, and no one has encircled it. I was trying to find a link to one of my posts. 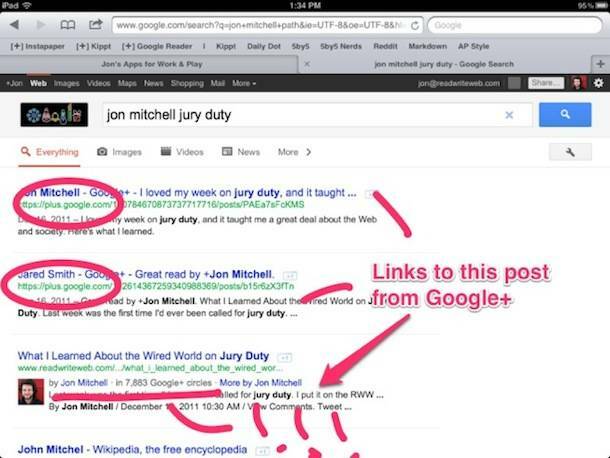 The quickest way to do that was to type ‘jon mitchell jury duty’ into the Google search bar. To my astonishment, the post I wanted was not the first result. It was the third. Ranking above the result I wanted were two Google+ posts, one by me, and one by our webmaster Jared, that were nothing more than links to the article with brief comments. Google thought I would prefer to click through Google+ to find my article than to go straight to it. I posted this screenshot on Google+ to see what my 8,000 … Followers? Plus-buddies? Plussers? +Friends? Friends+? Circlers? Encirclers? … To see what my 8,000 Encirclements thought. One comment (to which Google+ allows no way to link) said, “Yours is the top result when I search.” I presume she meant the article itself. Well, that didn’t make me feel much better, because it’s just a reminder that Google is showing different Internets to different people. This might be the Googlest thing I’ve ever seen. First of all, he designates himself a “user/reader,” which is just spectacular. And he goes on to say that he’d rather see a Google+ post about the article than the article itself, because, and I quote, “I can comment here without having to jump through hoops.” Hoops like reading the article? This darling “user/reader” has hit on the most touted feature of Google+: the conversations. Everybody finds it so much better than other forms of conversation on the Internet. It’s okay, sure. You can’t link to comments, but it’s not bad.  It lets you make things bold and italic. That’s pretty neat. But never forget that you’re Google’s product, not its customer. Why does Google want to facilitate long, riveting conversations on Google+ (with only one permalink, so the search results don’t get confusing)? Exactly. For the same reason blogs allow comments, despite the outrageous overhead of fighting spam. Traffic and search engine optimization. Google+ is the new SEO. Just look at what it’s done to Google News. In the name of highlighting authors, it now pulls in Google+ profiles. It doesn’t let the author choose, say, her own website as her profile. If she wants a clickable, personal link on Google News, she has to use Google+. Google does all this in the name of personalization. The public face of this effort is Amit Singhal, who presents personalization as this crucial element of context. Google can better figure out what a query means to each user if it has social signals, his story goes. But my query for “jon mitchell jury duty” didn’t mean “Show me what my Friends+ are saying about ‘jon mitchell jury duty. '” It meant “Show me Jon Mitchell’s article about jury duty!” The Google of a year ago would have known that. All this personalization and real-time stuff surely helps Google organize its content, but it’s breaking search. The mobile versions are cleaner, but it’s still Google+. I know the Android experience is apparently wonderful – is that surprising? – but despite the many glorious iterations of the G+ iOS app, there’s still literally no way to post a rich link to Google+ on iOS. You can paste a URL in with your text, but it won’t expand into anything worth clicking on. If you try to load the full Web version in mobile Safari, Opera or Dolphin (I’ve tried all three), the browser crashes when you click in the text box. Even Facebook can do this, and don’t get me started on how Facebook is ruining the Internet. Mobile is increasingly the key social device, because it’s the one you have when you’re out living life. Path knows it. Yobongo knows it. Even Facebook has rescued its mobile apps from the edge, giving its users as much consistency across devices as it can. It follows that Google would try to push Android as a vector for Google+. It’s trying to get us addicted to yet another free Web service and sell us to its customers, the advertisers. Google’s not alone there. That’s what Facebook does, and it’s what all of the above apps will do, presumably. But Google is different. Google used to be about organizing the world’s information. It was a service to the entire Web. But this social tangent is changing that. 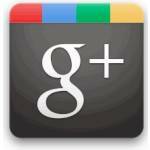 It’s turning the Web into a Google+ popularity contest. It’s making us labor to prioritize our Friends+ by how much they matter to us, or by other undefined criteria, while Facebook just sorts them for us. 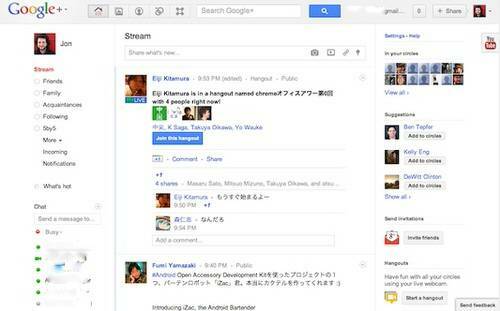 Google+ may have bought Katango to do the same. We’ll see when it ships. Google+ is encircling our relationships, and it’s encircling our identities. It doesn’t care how we want to present ourselves; our Google+ profile is our identity as far as Google is concerned. No pseudonyms or alter egos allowed. Large swaths of the blogosphere and the Web at large think this is wrong. At Web 2.0 this year, Vic Gundotra said pseudonyms are coming to Google+. Again, we’ll see when it ships. Thanks to the Scoble effect, I have 8,000 encirclements on Google+. It creeps me out, because I don’t know why I’m encircled by all these people, and I don’t really get what they’re talking about most of the time. Since I presume it’s because I’m a tech blogger, I am waiting impatiently for the day I can migrate this whole thing over to my RWW Google Apps account and just let Google+ be a work thing. Google is great for work. Gmail and Google Docs are nice things. Hangout meetings are fun. My work personality is much more measured, flat and bland than my real self, and Google tools are great for expressing that. Now that this rant is over, I’ll go back to covering Google and giving it as fair a shake as I can. I just had to get this off my chest. Note: Originally, the line “because it’s just a reminder that Google is showing different Internets to different people” read “because now I know Google is showing different Internets to different people.” I changed it, because my informal language gave trolls too much ammunition to make a distracting non-point.